Few people would hesitate to include Spain among Europe’s top cheese producing nations. The country is blessed with extreme geographical diversity – many don’t know that it’s Europe’s second highest country after Switzerland – which in turn makes for an incredible panorama of cheeses. For both their quality and distinction, many of Spain’s roughly 120 types of cheese have been awarded numerous honors at competitions around the world, doing especially well at last year’s World Cheese Awards. Yet Spaniards are some of the lowest annual consumers of cheese in Europe at just 8 kilos per person, half the European average and three times less than the French. Many feel this is due to lack of information and advice received by consumers. A quick glance at several cheese shops in my neighborhood reveals labels such as oveja curado (cured sheep’s cheese), cabra semi-curado (semi-cured goat’s cheese), without any reference to origin, pasteurization, or other traits that help explain why one cheese is different from another. What if I challenged you to name just five Spanish artisan cheeses? If we took away Manchego, could you name even three? For you cheese lovers who came up with an answer, could you then say whether the milk came from cows, sheep or goats, whether it’s raw or pasteurized, or how long the cheese has been ripened? Most people I put these questions to struggled for an answer, and that’s what Poncelet cheese shop set out to change. Poncelet – named after the Parisian street where the revered cheese shop Alléosse is found – opened their store in Alonso Martínez in December of 2004 with the goal of providing an exclusive outlet for the traditional and local producers of Spain and Europe’s marvelous artisan cheeses. At any one time, Poncelet carries between 300 and 350 European references in its store, out of which over 90 come from Spain alone, many of them unheard of outside their native home. 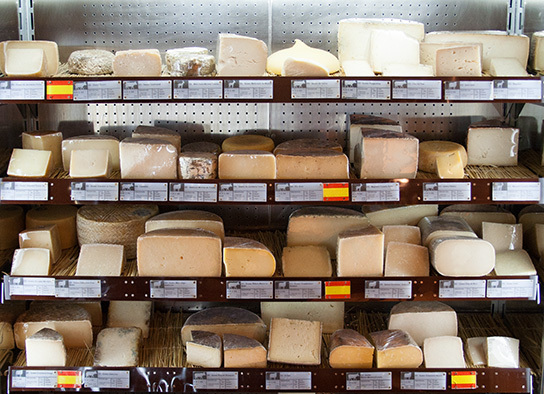 Cheeses are well-displayed throughout the immaculate store, overseen by employees who quietly move about wearing blue surgeon’s gloves; quite a contrast with the cheese shops “de toda la vida” found in rowdy covered markets. The shop’s polished image, along with its higher prices (roughly 20-30€/kg), have led some to dismiss it as one more place for pijos to blow their money. What people fail to understand however, is that the atmosphere and prices reflect the tremendous amount of work and tender loving care that go into the final product, both of which were recognized by the Wall Street Journal when it named Poncelet one of ten best cheese shops in Europe. As you enter the shop, one of the first things you’ll notice is the abundance of information. Each cheese has a corresponding label showing the most important details: name, country, region, maturity, animal, raw or pasteurized etc. In summary, what makes one cheese unique from the next. The second thing you may notice is the absence of brands, something that in a brand-saturated society almost seems worrying, as if the product couldn’t be “real”. Poncelet however works only with artisan cheese makers who are scattered across Spain and Europe. These non-branded cheeses are produced by small, dedicated, often family-run operations, whose livelihood depends almost exclusively on the cheeses they make. Once a cheese has been discovered, representatives from Poncelet visit the producer – every single one, regardless of their location – in order to meet the faces behind the product, have a look at the facilities and discuss transport options. During the selection process, a preference is placed on quesos de pastor or quesos de granja, i.e. farmhouse cheeses, made by the farmer, using only the milk from the farmer’s own herd or flock. In 2009 Poncelet set the benchmark even higher by opening Spain’s first Centro de Afinado (a ripening center), located in Alcobendas, in the outskirts of Madrid. In France, the practice of affinage is a well-known and long-respected profession. It requires an expertise independent of cheesemaking, where the affineur manages all aspects of the cheese’s ripening process, playing a major role in the final taste, texture and body. Jesús Pombo, Poncelet’s owner, wanted to bring that practice to Spain, embodied in the Centro de Afinado. The majority of Poncelet’s cheeses arrive here at a very young age. They’re then placed in one of the Centro’s multiple temperature and humidity-controlled chambers, where Poncelet applies the most appropriate ripening techniques so that each cheese reaches its optimal point. This can include brushing, flipping over, washing or rubbing the rinds with the right spices or liquids, followed by probing the cheeses (just like a leg of jamón ibérico) to check their progress. Another area where Poncelet stands above the competition, is its ability to offer and advise on quesos de temporada, or seasonal cheeses. We’ve become so accustomed to consuming year round, especially foods such as produce, that we often forget the seasonal nature of food. We prefer instead to complain about the insipid taste of a tomato eaten in January. While many cheeses are also available year round, they too have their peak seasons, depending on ripening time and when the milk was obtained. In Spain for example, cheeses made from spring milk usually offer the best flavor. Something to ask your cheese monger about the next time you buy. With the goal of continuing to educate customers, Poncelet organizes events such as presentations, tastings, and weekly classes. There’s even a monthly visit to a local goat’s cheese farm in the outskirts of Madrid, followed by a stop at Poncelet’s Centro de Afinado, which explores the cheese making process from start to finish. Or you can simply start on your own by taking home a few wedges and using the fantastic resources on Poncelet’s website to learn more about the cheese you bought. Here are five of my favorites to start with, just in case you failed the opening quiz. Mahón Menorca – A farmhouse, semi-cured, raw milk, cow’s cheese from the Balearic Island of Menorca. Idiazabal de Pastor Ahumado – A farmhouse, cured, raw milk, lightly smoked sheep’s cheese from the province of Guipúzcoa in the Basque Country. Majorero de Fuerteventura – A cured, raw milk, goat’s cheese from the Canary Island of Fuerteventura. Puig Pedrós – A farmhouse, semi-cured, raw milk, cow’s cheese from the Catalan Pyrenees. Rulo de Madrid (de San Martin de la Vega) – A young farmhouse, raw milk, goat’s cheese from southern Madrid. This is a rare find in Spain. Raw milk cheeses must typically age for at least 60 days to ward off any concerns at the microbiological level. However, the law stipulates that if the raw milk is of exceptional cleanliness and quality, no minimum ageing applies, which is the case with this cheese, matured for a little over a week.